Bet they are all CIA under cover agents. Forget the US why have the Russians got so many? That is an astronomical number. Why the hell Peru has so many ? 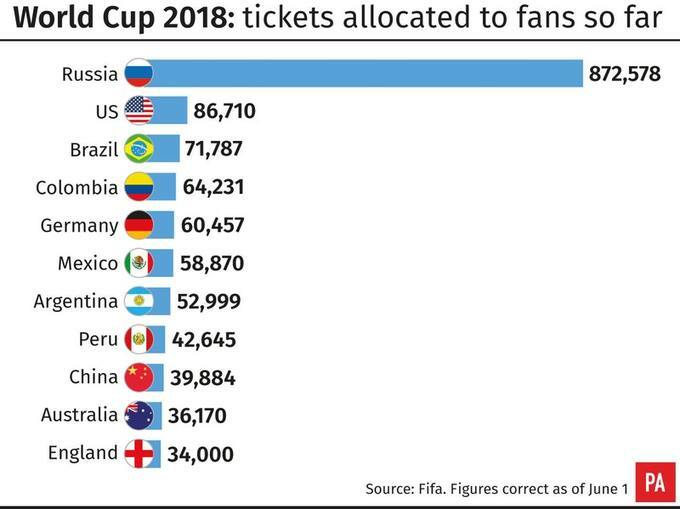 It always surprises me how many south american fans go to the world cup and to be frank i'm surprised that many can afford to go, but I guess there's a massive disparity between the rich and poor in those countries. The host usually gets over 50% of overall tickets and USA normally have the second biggest allocation, but it is surprising considering they aren't even in it! The yanks do love the football world cup though. 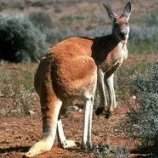 I'm surprised that many English are going out there. Is that the actual allocations or is that how many have been bought by people in those countries? I’m sure I read England returned loads because they only had 30,000 suicidal people willing to be murdered at the hands of Vladimir and his pals. Stab in the dark but most international corporate sponsors are probably HQ'd in the US so could be classified as a US ticket? Fair play to the 34000 england fans. Absolutely nuts to go to Russia when we don't have any ambassadors there anymore. We are really the only surprise there. - Argentina are the highest class nation in South America. Been in dire straits as of late but they are still above the rest of the continent. - Brazil whislt a disaster, still has 300 million people. We are a nation of 30 million and are very capital-centric. Most of my friends aren't of my class, I have about 5 friends who are higher class citizens, and the rest are medium to lower. We are a very under developed nation despite being in a much better state since the Sendero Luminoso days. Here there's a sizeable amount of people earning about 2000-3000 USD per month so it's not surprising. I am personally struggling to find a job that pays well here, in comparison to Canada where the minimum wage is 15 CAD per hour, so fair play to the Peruvians who went. Especially considering we were the very last team to qualify. Genuinely confused, I thought you were a journalist?! I am, but I'm also 20 and still doing part-time jobs. Isn’t Argentina the country with the biggest European investment in South America? I do know for a fact that Argentina is Spain’s number 1 nation of investment and has been for decades. It was in the past, think it's Brazil now. I know Spain was n1 investor for many years, but it's the US now, although you may go back to n1 in the not so distant future. Strangely Holland is number 3 hehe. I know Europe has a massive interest in the Argentine market because of where I work. We get Second party Argentinian contracts all the time that are worth millions. In our monthly graph Argentina is consistently top on the most stable South American nations and most pro European for marketability. Isn’t that like most countries though, as in you have to be a certain age to earn that money? And there’s about a million different ways to get out of paying the basic wage as well? I mean, yes but I'm talking more about me searching for wages on job applications - but it could also have to do with my occupation. Journalism in general doesn't pay well here. I was comparing the minimum wage from here to Canada though. Here its 15 soles, which is 5 CAD. In Canada, its 15 CAD. Both per hour. Its very possible to get out of that, but I think you can see the difference in development between the 2 countries just by that. You largely overestimated your minimum wage Brian, just looked it up and it's $270 USD per month, closer to 5 soles per hour than 15. Ah - well I got my details wrong then. I remember being offered a job and being told that I would be payed minimum wage - which they offered 15 soles. Remember I lived most of my life in Canada.